What's In A Mommy Bag? When I was still younger, I used to sneak in my parents' room, my mom's closet, fit her shoes, wear her clothes and accessories, and go through her BAG! I've always been intrigued about my mom's bagella, know what's inside it, check what color of lipstick was she bringing, delight at how fancy her purse looked, hunt for goodies she might have forgotten to give me, just to satisfy my curiosity. Now that I am a mom myself, though I have two boys, they are always excited to see me when I get home from work to rummage through my bag (search for pasalubong)! What's with a mom's bag that sparks that child's wonderment? 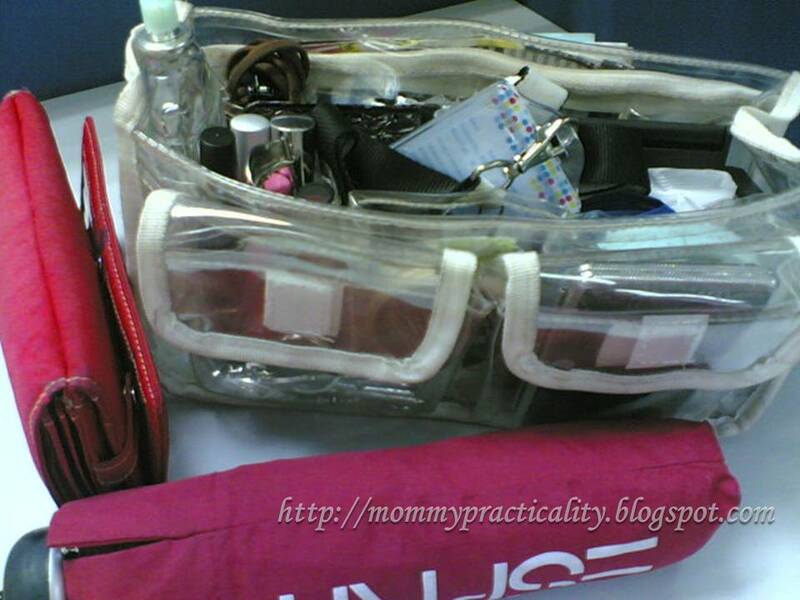 So to answer that WHAT-IS-IN-A-MOMMY-BAG puzzle, here's my own expose! 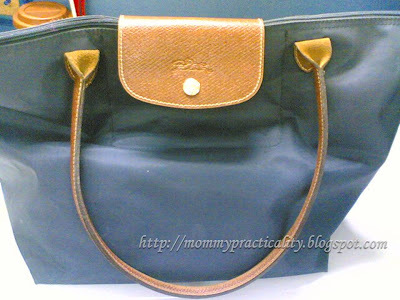 I like carrying BIG bags because I have a lot to bring especially when out with my kids! hate digging for something I cannot find just because everything is mixed up! VOILA! I took out each and every content of my bag. 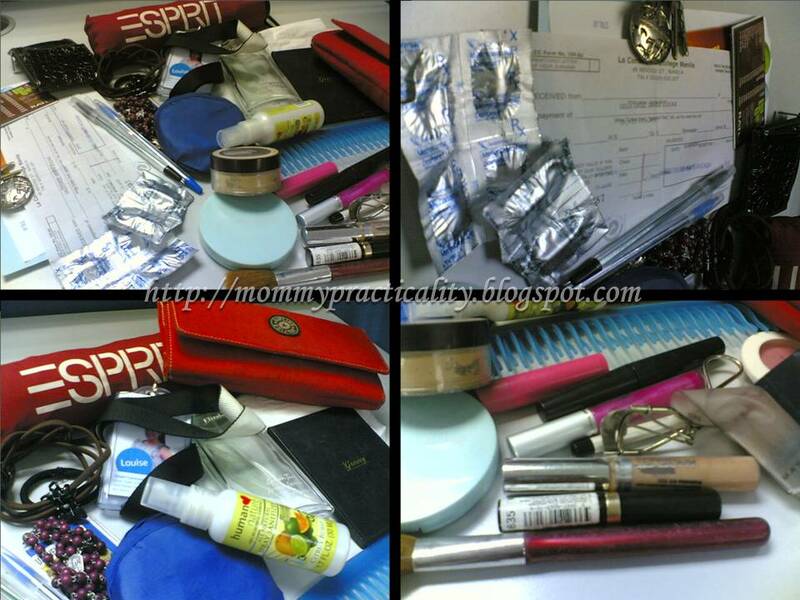 I'm surprised myself at how messy it could really get without my dear bag organizer! It helps that I have a Beabi Bag Organizer to keep all these stuff neatly placed in different compartments. My Beabi organizer has a total of twelve (12) compartments which is perfect for mommy bag like mine. So next time my kids go through my bag, at least I know they wouldn't create so much mess. As kids, they love taking out something from one compartment and transferring it to another, just like a Shape Sorter toy. My bag is super full as I have to bring along diapers and extra clothes and wipes for the baby besides the usual- wallet, keys and handphone. Before having kids, I could go out with a teenyweeny bag with just my wallet, cellphone, a handkerchief, perfume and a handspray. Since having kids though, I've had to lug huge totes filled with all the toiletries they need and extra clothes for changing into when needed. I have 2 kids. I used my LC bag as well as a diaper bag at the same time. The only kikay stuff for me is my make up kit and my shades. The rest are for my kids. hahaha! hahaha, i also carry a huge bag, dami ko ring anik-anik! What an organize bag you have! Before, I was eyeing for a bag organizer but then, I di not push the idea since I had small ang minimal items on my bag. Except when I am going home to Bulacan, where I use backpacks. My bag is always quite messy and sometimes i think I need a bag organizer. I also want a big bag but with dividers to put my stuff in order. When I was still single, my bags are all small, just the wallet and cellphone inside. But since I got married and started to have kids, I shifted to a big bag which, most of the time, seems not enough because its always overflowing with things. My nanny complains whenever I ask her to carry my bag because its too heavy she wonders what's inside and how I manage to carry it with me all the time. You have a roomy bag. My bag is a mess and I end up fishing my things when I need it. my bag contains garbage. really. my best friend used to organize it for me almost every other day that was way back in college. i don't know why it always nd up messy. when i changed bags, its all arranged. hohum. I also love big bags and I also bought a bag organizer. Like you I hate to bring out all the bag's content just to look for a small thing. So I keep an organizer inside. Oh, my 2-year old son also loves to raid my bag for the pasalubong. Aside from that, he likes to get my wallet and my cellphones. haha. Oh well, I guess pare-pareho tayong mga mommies! We love carrying big bags and our kids love raiding them as well! Thanks for visiting! moms do have a lot to bring when going out! I love big bags too. Same tayo. I love your orgnizer. Where did you get it? Thanks for the compliment Aby! :) It used to be a garbage bag.. thanks to my bag organizer! Go go blog about yours, don't forget to hit me back a comment with a link to it! :) Thanks for visiting! You have a lot in your bag... lol.. in my bag I have umbrella, water, wallet, cards, pen, cellphone, banana or biscuits and scarf.. lol..
Hi Ms. Journ! Yes a LOT! It becomes a LOT MORE during weekends for I have to put in my kids' stuff! Thanks for visiting! Hi Sis! This is a great idea! think I would love to get that bag organizer, too. Pareho pala tayo, I always have medicines for migraine in my bag as I used to have migraine attacks too. Hi Krizza, I got this from Beabi. Yup migraine gets in the way sometimes so I should always carry meds for that. Thanks for visiting! Hi Khimbyrlee! Thanks for visiting. Ooh, I wish that's true for all men! hahaha! Your bag is so organized. If I can fit my things in my pocket, I won't carry a bag anymore! haha I am an anti-bag girl. I only carry cellphone and cash. Sometimes, I ditch the cellphone. hehe! That is the beauty of living in a small town. I can always go home if I forget to bring something. When I travel, that is the time that I carry a lot! Ang bigat and I am a light traveler! Hi Gerilen Elinessete! Same here, ganyan din ako before kaya I bought this bag organizer. To keep everything in place. =) Thanks for visiting! I don't go out a lot anymore. I prefer to stay at home. But whenever we go out on weekends, we(ehem), hubby carries a backpack with my son's things and some of mine. Hahaha! Nakatago para di mapansin na nakilagay ako. Hahaha! When I was working, I carry a small bag and keep everything small. As in, naglilipat ako ng cologne, hand hanitizers, powder, etc sa mas maliit na container. Hi Samantha Lee! Thanks for visiting! puro small na nga yung mga stuff ko except the cologne, di ko siya malipat sa automizer. :) Thanks for visiting! lots of things in there! you're a girl scout! Hi Gelo! Yup a girl scout I am! :) Thanks for visiting! Hi Jhenz, ako naman when I was in high school, bag is filled only with school stuff hehehe! Thanks for visiting! Hi Yhey, go go go get one na. It helped me a lot as seen above. Without it, super messy and halo-halo na ang bag ko! Thanks for visiting! 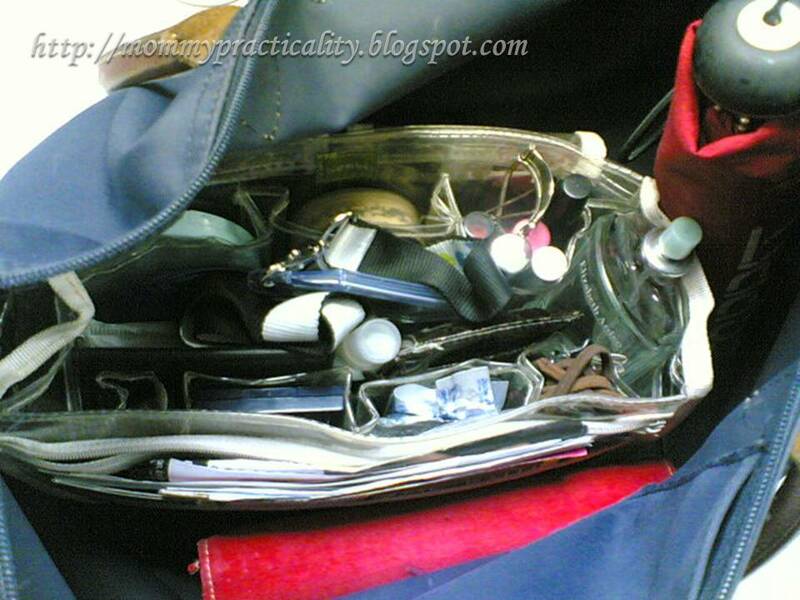 I know what's missing inside my bag...make-up. I only have the basic pressed powder and lip balm. :-) I rarely have perfume or cologne as my nose is quite sensitive. I'll have a sneezing spell hehehe. I could use one of those beabi organizer. Pretty neat ! Hi Sanna! Do visit their store, they have one at MOA and newly opened Robinson's Magnolia. :) Thanks for visiting! Hi January! There are plenty of bag organizers at SM or Landmark or Beabi (where I bought mine) I'll check yours too! Thanks for the visit.